You will notice iTunes Purchase Link on some YouTube videos pointing towards iTunes Store. These are Merch Annotations and here are details. Usually people searches with Add Link to iTunes Store on YouTube and it brings up either old or wrong details. The specific feature is called Merch Annotations and is available for Google Play, iTunes, Spreadshirt, District Lines, Topspin, Cafepress, Jinx, Shopify, Songkick etcetera stores. Here is how you can add your Merch Annotations (Merch derived from Merchant) to Add Link to iTunes Store. You should read the article on YouTube Live Events – which is special feature, not available to all. You must be selling your own product (digital or physical), to use Merch annotations you need to verify your account and make sure it is in good standing. You can check if your channel meets this criteria on the YouTube official guide. Obviously, the channel must be partnered like ours. If you are thinking of how that Link appears on each music or videos magically, we can point you towards some theories – for original content you must have Content ID enabled. We have Content ID enabled. We have same video on iTunes too. Now, the system can automatically detect this meta data from Music Lebel. There is no such permission from YouTube stuff. It is the label or International Standard Recording Code (ISRC) from meta data fetched from another third party to add links to avoid automated wrong addition to frank pirated videos. It is API based function, automated thing. At this point, you should read Twitter Card iTunes, iOS App Links Implementation Guide for WordPress for the iTunes part. It is complicated. It is usually said that, having content on musicbrainz.org’s database fastens the process. There is no such “big artist”, “small artist” thing. The content is yours, fully cross verified, you added annoyed link – thus automatically the thing is linked. From your Video Manager, click the downwards arrow next to the Edit button of the video you want to change, then click Annotations. Click the Add annotation button to create a new annotation. Check the ‘Link’ checkbox to add a retail url, then choose the Merch category in the drop-down menu. When you have placed an approved retailer link and have finished editing your annotation, select Save and/or Publish. By the way, only https protocol will work from Merch Annotations. When link will appears under on each music, it will directly open iTunes App. The advantage is => even if you music, creation is stolen, the API will chase and put the purchase link. This Article Has Been Shared 4921 Times! HTTPS is an application protocol based on HTTP, for the secure transfer of data from Hyper Text, it is the secure version of HTTP. Smartphone Security in the Cloud is important as the unprotected smartphones using Cloud based applications can create security and privacy issues. How To Start and Make a Multi-specialty Business Successful ? You might have dream, but might lack the other resources. Here is a comprehensive and easy guide. DTH Service provider in India are not limited in number. The limiting factor is the knowledge of the resellers.Here is evaluation and conclusion for HD Quality. Simple Mail Transfer Protocol, usually abbreviated as SMTP is a communication protocol used to transfer electronic mail (email) to the email servers. 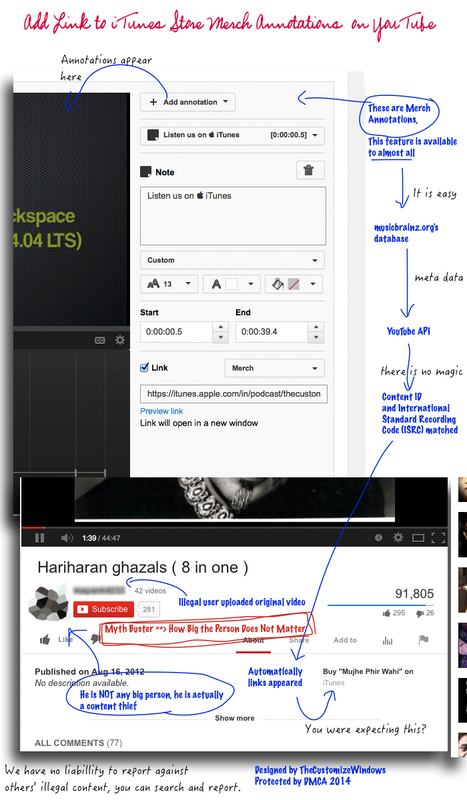 Cite this article as: Abhishek Ghosh, "Add Link to iTunes Store (Merch Annotations) on YouTube," in The Customize Windows, May 14, 2014, April 21, 2019, https://thecustomizewindows.com/2014/05/add-link-to-itunes-store-merch-annotations-on-youtube/.